"Market in the Meadow is a Holiday Gift Sale presenting over 180 booths with unique gifts and specialty merchandise from a variety of vendors. All proceeds from Market in the Meadow benefit the Forest Meadow Jr. High PTA. Forest Meadow Jr. High is located in Lake Highlands and is part of the Richardson Independent School District. We hope you will join us for a fabulous shopping experience this fall! In addition to great shopping, Market in the Meadow offers the Charger Café, featuring delicious food from local restaurants. Stop by the Bake Shoppe early to purchase baked goods prepared by our wonderful volunteers! Entertainment is provided throughout the weekend by local junior high and high school bands, choirs, cheerleaders, drill teams, and dance teams. " Admission Fee is a Canned food donation. They are partnering with Communities in Schools( CIS) to help restock the food pantry..
"This is the 6th annual Fall Crafts in Chelsea, a 100% handmade market that brings over 60 local, independent artisans and crafters to benefit PS 11, an elementary school with an extremely involved PTA, parent body, and neighborhood. Shoppers flock to see returning favorites as well as some new vendors at each show. There are activities for kids inside the school; the market is outside in the street." "The Caddo Mills Motor Club will host it's 5th annual benefit car & craft show. There will be lots of collectible cars with prizes in 20 categories. 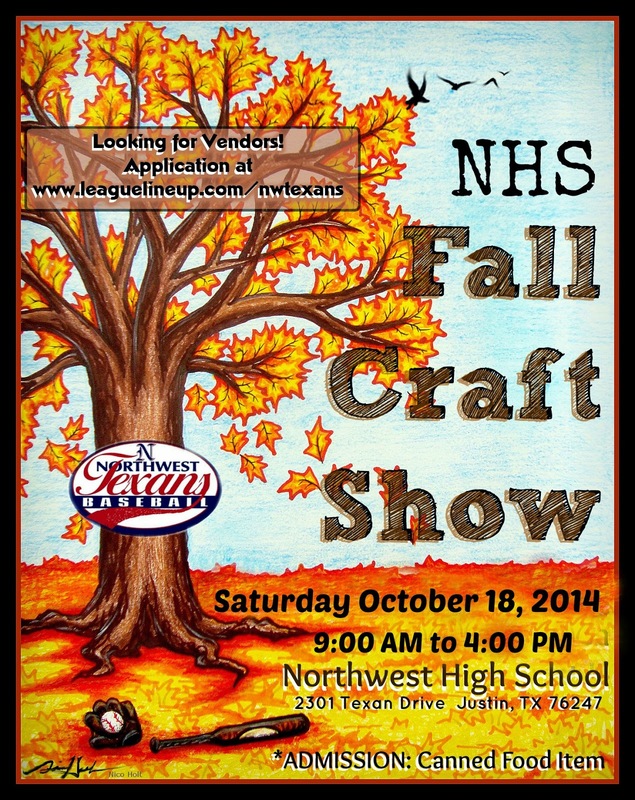 We are also looking for craft vendors for this event. The vendor fee is $25, and booth size is 12 X 12. Proceeds from this event will benefit the club's scholarship fund and the local community." "All proceeds from the raffles and the Bake Shoppe will benefit the Grace Avenue Missions, Ministries and Assistance fund (GAMMA). The buildings will be filled with Christmas crafts, gifts for kids, scrapbooking supplies, hand-crafted jewelry, home decor, gourmet foods, stained glass and glass art... and much, much more! You're sure to find the perfect Christmas gifts for your friends and family - and maybe even for yourself! The Bake Shoppe will be open during the Holiday Bazaar, filled with home-baked cookies, cakes, brownies and lots of other sweet treats! Snack while you shop or buy some goodies to take home. Enter our raffle and choose from more than 50 great prizes! It will be open in conjunction with our pumpkin patches - free activities for all ages!" "For the past 26 years, Kennedale High School PTA has hosted a Senior Scholarship Auction and Chili Supper. This incredible event has helped hundreds of Kennedale High School graduates further their education through college or technical institutes, we provide up to $500 scholarships to qualified seniors. We have a chili auction, car show, silent & live auction and a craft fair." "Woofstock will be on October 18th starting at 11am at Little Elm Park in Little Elm TX. There will be A Car Show, Live Music, Bounce Houses, Games, Silent Auctions, Dog Adoptions, Low-Cost Vaccinations and Microchips, Pet Photography, Pet Costume Contest, Hippie Contest and Much Much More! This will be our 6th year and the most important year yet, all money raised thru this event will go to finding a new location to house our little campers and saving more animals from the DFW shelters." "Home décor, boutique clothing, jewelry, holiday décor, gifts, spirit wear, custom furnishings, unique finds, vintage treasures, delicious sweets/treats/eats and lots of family friendly activities. Sponsored by King’s Daughters Girls of Grace Circle. Benefitting Children and Families in need in Johnson County."